“The fine tuning problem led scientists … opposed to the Intelligent Design hypothesis … to the Multiverse hypothesis” – In other words, scientist are prejudiced like everyone else and throw out nonconforming hypotheses like ID while embracing equally speculative ones like Multiverse. But the Multiverse explanation is just a desperate appeal to Randomness, an unobservable concept by definition that cannot explain anything. In fact all modern cosmology – including cosmic inflation, quantum fluctuation, string theory, multiverse, theory of everything, dark energy and dark matter – are all new scenarios trying to explain away previous inconsistencies given a materialistic-atheistic prejudice. To account for all complex phenomena we observe, the Universe is imagined as a more and more complicated wind-up toy mechanism that follows an inevitable trajectory with some allowances for the randomness conjecture. 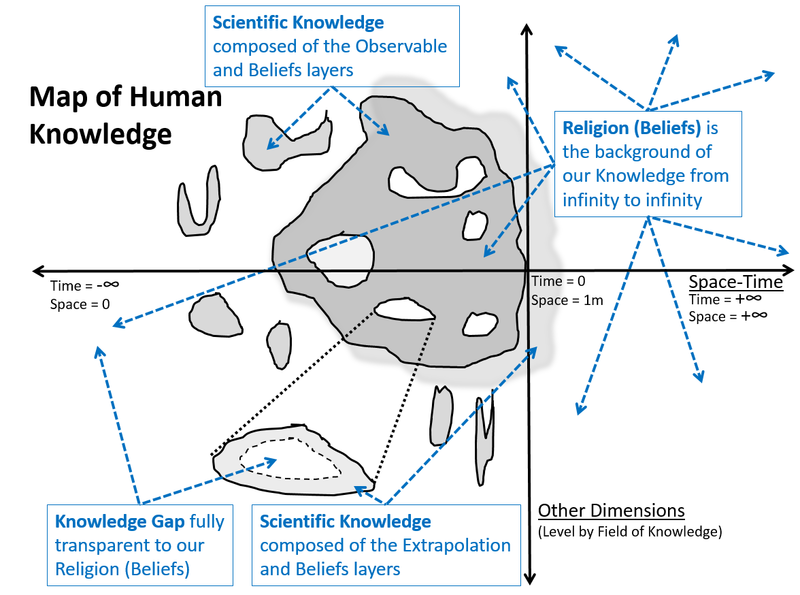 “Scientists don’t take beliefs on faith” – But they very much do so as faith is absolutely a part of science from assumptions to extrapolation of all experiments, and results interpretation (faith limits the range of hypotheses considered). “We long for immortality…when all evidence in nature argues against us” – The evidence argues for transformation. Death and complete dissolution are only corollaries of the materialistic view. But even matter is not material when you look deep enough (see string theory, virtual particles, etc.). “Atheism-deism-immanentism-interventionism” – It’s nice to see an implicit agreement that atheism is a religion – the next step is to understand that religion is an integral part of science and that it is OK for religious views to differ. If you believe in atheism, you are also liable to find Dawkins convincing …or perhaps you just have not seen a clear set of counterarguments. “First principle, Central doctrine of science, and Beliefs that do not submit to the methods and reductions of science” – Yes, absolutely people do hold prior beliefs – we could not function without them. When pressed, some would say “Science makes no assumption that all natural laws apply in the same way everywhere. The scientific method just leads one to proceed as if natural laws apply as we’ve observed them to until further observed evidence suggests that they don’t”. But in practice “as if” becomes “dearly held beliefs” that not only affect the assumptions but also the result interpretation. Even though we just don’t know and cannot forecast the unknown, in practice no one doubts the sun will rise tomorrow and no one ever doubts that tomorrow 2 + 2 = 4 just like today and yesterday. “The belief that laws of nature are discoverable” – this topic deserves a more in-depth discussion (like here and here), not just a tangential mention. “Symmetrical universe, Art symmetry is sometimes broken” – this is one of those observations without any evident conclusion. Some say that symmetry minimize energy or that beauty is “evolutionarily necessary” (whatever that means) or invoke “optimize” and “benefit” – two concepts that only make sense in a Creationist (i.e. Intelligent) universe. “Erathosthenes measured earth circumference to 28.5k Mi in the 3rd century BC” – this is worth mentioning because the indoctrinated masses believe that mankind didn’t know anything before this or that discovery. Some discoveries are truly revolutionary and exceptional, but more common, ideas are circulated for a long time before they gain enough support to become dogma. “Vitalists vs. mechanists, Living matter obeys different laws than nonliving” – Mechanists criticize Vitalists but they constantly conjure the hocus-pocus of “Arising”. Life is obviously a quantum leap from non-life as any comparison of a dead versus an alive organism shows. Alive organisms follow all the identified physics and chemistry laws that non-life follows and, in addition, a new set of specific laws including: birth from very similar parent(s), growth, death and decay, metabolism, survival struggle, and reproduction struggle. Physical transformations of nonliving objects could be analogous to growth, death or metabolism of the living, but the struggles of living organisms or the generational inheritance have no correspondence in the inanimate world. ‘Natural selection’ has no meaning in the inorganic Universe. “Habitable zone of other stars, Life is an afterthought” – So far we have a total known population of 1 (one) planet supporting life. Sure, there might be water out there, the right temperature, pressure, and other goodies. But is life = water + oxygen + carbon + other lifeless goodies? See more. “Laplace had no need for God assumption” – We can safely say Laplace did not have a complete model of the formation and operation of the universe as claimed. Smart people do make mistakes. Einstein also famously claimed “God does not play dice” as if he had a direct line to God. “Physical universe governed by completely rational laws, Body and mind are purely physical” – Rational is personal – perfectly reasonable individuals can, and in fact must disagree. This is again the mechanistic view discussed before and which is most certainly wrong for no other reason that people always use obsolete current metaphors to explain the unknown. Depending on the timeframe, the mind is explained as mechanism, hydraulic system, switches, software, the internet, atoms/molecules. Posted in News/Books and tagged Alan Lightman, Atheism, deism, Erathosthenes, fine tuning problem, immanentism, interventionism, mechanists, The Accidental Universe, Vitalists.